HOUSTON – Third Palm Capital has opened Republic Square, located on a large parcel of land in the Energy Corridor of west Houston. The heavily wooded site was formerly the site of the Exxon Chemical campus. While there was a lot of inaccurate information going around about Republic Square, Realty News Report was the first news outlet to sit down and interview (in June 2015) a Third Palm executive about it. This Q&A interview with Cameron Graham of Third Palm continues to attract many online readers. When Realty News interviewed Graham in Miami in 2015, oil was over $100 a barrel and the Energy Corridor of Houston was one of the hottest office markets in the world. Since then the oil markets crashed and Houston office market is swamped with an oversupply of office space. Third Palm is leasing the existing buildings on the Republic Square campus and working on long-term plans for new development. Third Palm’s Cameron Graham, who also leads Cayman Islands based Dart Enterprises Contracting Co., said Third Palm has been acquiring development land and assets in Florida and New York and is in a period of strategic planning before ramping up development and marketing activities on a national basis. Third Palm acquired the former 35-acre Exxon Mobil Chemical campus in Houston’s Energy Corridor. Over the next few years, the project will be developed as Republic Square. Republic Square, near the intersection of Interstate 10 and North Eldridge, will include 2.6 million square feet of office space, 100,000 square-feet of restaurant and retail space, two hotels, a fitness center and 800 multifamily residential units. The project is funded with international private equity capital through Third Palm and Dart Enterprises. 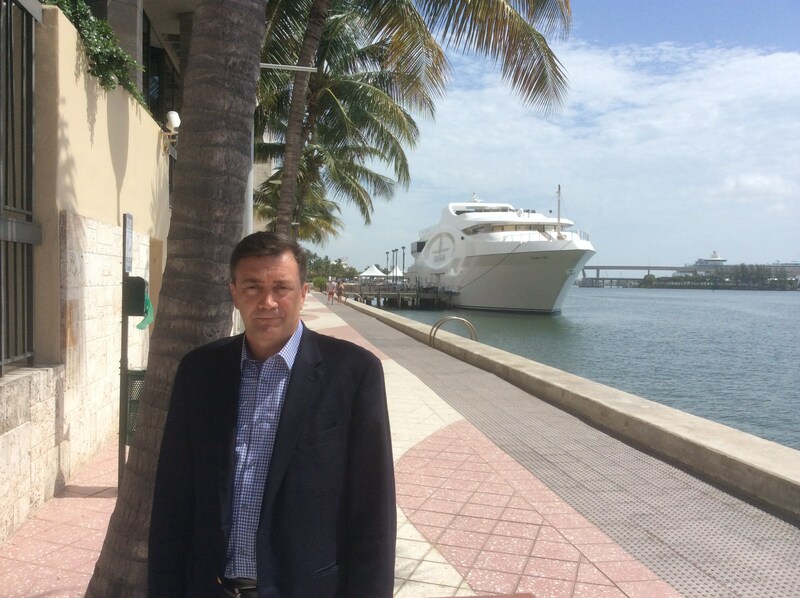 Graham attended the recent NAREE – the National Association of Real Estate Editors – conference in Miami. Taking a break from the conference, Graham granted Realty News Report the first in-depth interview on South Carolina-based Third Palm’s plans for its massive Houston project and the firm’s expansion in North America. Below are excerpts of Graham’s interview with Ralph Bivins, editor of Realty News Report. Realty News Report: Republic Square, which was billed as the future “Central Business District of the Energy Corridor” is going to be a large scale project in west Houston, where office occupancy has gone down somewhat in recent months. What’s your timetable? Graham: It’s obviously a long-term deal. It’s not going to be built in one phase. The market will really dictate the pace that it’s constructed and brought to the market. “The thoughts are the hotel, some retail that’s mostly food and beverage, fitness center and some multifamily will go first, with office to follow. Realty News Report: Republic Square has a deep project team with Elkus Manfredi Architects, Pickard Chilton, Kirksey, Sasaki Associates and PM Realty Group (PMRG). Will your organization open an office in Houston? Graham: We may have 1 or 2 people on the ground. Realty News Report: Does PMRG own a stake in Republic Square? Realty News Report: The Republic Square site that your firm purchased is phenomenal – 35.2 acres with frontage on Interstate 10 and Memorial Drive, bordering Terry Hershey Park. How did you find it? Graham: HFF put it together and auctioned it on behalf of Exxon Mobil (the seller.) PMRG identified the site and we did a proper evaluation and it worked out. Realty News Report: Do you have any other deals in Houston? Realty News Report: Are there other places around the nation you would consider for future projects? Graham: San Francisco, New York, Orange County, the Texas Triangle. If you look at the data, the Texas Triangle is probably as hot as anywhere in the whole country. Realty News Report: What made you decide to make a major play in Houston? Graham: The opportunities and growth in Houston. Everywhere would look: the jobs, the general activity. Houston is a favorable environment for business. They are business friendly. Realty News Report: What did you think when you attended the recent ULI (Urban Land Institute) conference in Houston (May 2015)? Graham: It’s a can-do city. Realty News Report: Why does the Republic Square development plan emphasize mixed-use, lifestyle and walkability themes? Graham: We see that as a niche in the market. We do see the long term need for this type of facility and the need of companies to utilize office space with fitness facilities and retail nearby. Realty News Report: You’ve got holdings in Houston, Florida and New York. You’re well financed with international capital. What’s next for Third Palm? Are you focused on development or acquiring more land positions? Graham: We aren’t mature enough to have developed a full strategic plan. Some property has been acquired. But this is a fledgling company that’s only been in existence just over a year now. There are a lot of decisions to be made and strategy to be figured out. Next: Can Cities Learn Anything from Suburbs?